Finally, an inflatable play area just for the little guys. 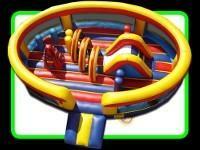 They can bounce, run, climb, and slide on their own inflated playground area. No big kids allowed! The unit is 16 feet X 24 feet with a 5 foot wall all the way around it.